Riverside, California, was founded in 1870, and named for its location beside the Santa Ana River. It became the county seat when Riverside County, California, was established in 1893. Prior to the colonization of Mexico and Alta California by Spain, the land that would become Riverside, California, was frequented by various Native American people. No permanent settlements are known to have existed, but occasional villages close to the river were documented by later explorers. Artifacts found at White Sulphur Springs, as well as grain grinding holes in rocks south of Mount Rubidoux, provide evidence of the Native American activity. On March 20, 1774, Juan Bautista De Anza, leading an exploratory expedition to find a good land route from southern Mexico to Alta California, reached the area today known as Riverside. He, and others in his contingent, described the area as a beautiful place fragrent with rosemary and other herbs, and having rich grasslands for their horses and cattle to graze. He named the area Valle de Paraiso, or Valley of Paradise. This was the first official record made of what was to become the city of Riverside. De Anza lead a second expedition through the area on December 31, 1775. This expedition was a colonizing expedition headed for Monterey. They spent New Year's Eve on the banks of the Santa Ana River, and crossed the river the following day. The routes taken by the two expeditions is believed to have followed a course from somewhere near Lake Perris, in current-day Moreno Valley, down the Box Springs grade near the 60/215 Highway interchange, and across Riverside in the direction of the Martha McLean – Anza Narrows park. A marker in the park was dedicated to recognize the point where the group crossed the Santa Ana River. To commemorate De Anza's expeditions, the city of Riverside, through private donations and a federal grant from the Works Progress Administration, began work on a 20-foot statue of De Anza in 1939. The dedication took place in May, 1942, at the corner of Market and 14th streets. Riverside was founded in November 1869 (another source states 1870) as a colony by the California Silk Center Association. A navel orange, also known as the Washington, Riverside, or Bahia navel. In 1873 Eliza Tibbets convinced William Saunders,[Note 1] Superintendent of the fledgling Bureau of Agriculture, to make her a test grower for his new seedless oranges from Bahia, Brazil. By planting and nurturing the orange trees that Saunders sent her, Tibbets revolutionized the citrus industry. Introduction of these oranges, later called the Washington Navel Orange, proved to be the most successful experiment of Saunders' tenure,[Note 2] and one of the outstanding events in the economic and social development of California. [Note 3] For the next 60 years and more, a great industry was built up from the two small trees planted in Riverside by Eliza Tibbets. Tibbets' success with the navel orange had led to a rapid increase in citrus planting, and the citrus planted was predominantly the Washington navel orange. The commercial success of these early orchards soon led to a widespread interest in this variety, so that by 1900 it was the most extensively grown citrus fruit in California. The growth that the Washington Navel Orange (WNO) produced in Riverside spread throughout the state, driving the state and even the national economy. Citrus assumed a major place in California's economy. [Note 7] By 1917 WNO culture was a $30 million per year industry in California. By 1933 the WNO industry in CA had grown to an industry with an annual income of $67 million. From one million boxes of oranges in 1887 to more than 65.5 million boxes of oranges, lemons, and grapefruit in 1944, despite the depression years of the 1930s, the California citrus industry experienced nothing short of explosive growth. The success of Tibbets' orange inspired irrigation projects which converted more desert to orange groves. The size, scale, and ingenuity of the irrigation structures in Riverside and surrounding area are considered one of the agricultural marvels of the age. By 1893 Riverside was the wealthiest city per capita in the United States. Money poured into California. [Note 8] Tibbets' orange led to an estimated $100 million of direct and indirect investment in citrus industry over the next 25 years. But Eliza Tibbets' orange did not merely feed the wealth and growth of existing towns; new cities and towns popped up whose birth, existence, and future depended upon the condition of the orange market. In 1886 alone new citrus towns were laid out in Rialto, Fontana, Bloomington, Redlands, Terracina, Mound City (Loma Linda), Guasti and South Riverside, (Corona). Irrigated communities like Etiwanda, Redlands, Ontario and many others were launched. The rapidly expanding citrus industry also stimulated the capital market for real estate. As the industry grew, land which had been regarded as worthless dramatically increased value. Not only did orange culture feed the land boom of the 1880s in Southern California; it allowed Riverside to survive when the land boom collapsed in 1888. (See also: Panic of 1893.) The success of Tibbets' orange stimulated related industries. Citrus built the foundations of the region's economic modernization before the great flood of defense funds began in World War II. [Note 9] Tibbets' introduction of the Washington navel orange was largely responsible for the fruit packing houses, inventions in boxing machines, fruit wraps and the iced railroad car. By the mid-1880s, five packing houses sprang up in Riverside. Many methods developed in the course of the growth of this industry, which had a wide application, to other fruit growing industries as well to citrus. The study and efforts of pioneers in the development of the California citrus industry led to the invention of fumigation, of orchard heaters, and of many other methods of culture. In 1897–1898, Benjamin and Harrison Wright invented and patented a mechanized orange washer. By the end of 1898, two-thirds of Riverside's packinghouses were using the machines. At the turn of the century, Stebler and Parker began manufacturing citrus packing machinery in Riverside independent of each other. The companies, which merged in 1922, became the California Iron Works, and later still Food Machinery Corporation (today's FMC Corp.). The Santa Fe Railroad opened a direct line to Riverside in 1886, allowing direct shipment to the east. Eight years later, the first refrigerated rail cars shipped oranges from Riverside to the east on the Santa Fe Railroad. Another illustration of the results of the success of the citrus industry in California was the organization of the growers into an exchange for the co-operative handling of their crop and its distribution. California Fruit Growers Exchange, a cooperative marketing association made up of local growers, was founded in 1893; it is now known as Sunkist Growers, Incorporated. A key feature of the growth of the Washington Navel orange industry was a scientific approach to improvement. Study of propagation culture handling, transportation and other phases of producing distributing and marketing the crop was largely responsible for advancements used not only with citrus but also in other fruit industries. In 1893, cyanide gas was used to fight citrus scale. A U. S. Department of Agriculture scientist helped growers to harness nature's biological wrath during the "decay crisis" of 1905–1907, when alarming proportions of fruit spoiled in transit, and wed the industry to the scientific expertise of the USDA. Growers, scientists, and workers transformed the natural and social landscape of California, turning it into a factory for the production of millions of oranges. Orange growers in California developed the commercialized agriculture that only spread to the rest of the country a generation later. In 1906, University of California established in Riverside its Citrus Experiment Station, the beginnings of the University of California, Riverside. Originally located on the slope of Mount Rubidoux, the station institutionalized the scientific expertise, support, and presence of the state's university and the federal government in the citrus industry, and brought quality control to the first link in the corporate agricultural chain. In a field department was created which provided member growers with scientific and practical horticultural advice and direction that ultimately led to huge gains in productivity. Tibbets' orange allowed agriculture in California to survive transition from wheat. Wheat had been the single most profitable crop statewide between 1870 and 1900 as California became one of the largest grain producers in the nation. Sometime about 1880, many agriculturalists in the central valley and Southern California began to convert to fruit. Soil and climate were obviously conducive to such a conversion. After the turn of the century, wheat exports began a rapid decline prompted by intense Canadian and Russian competition and declining grain yields due to soil depletion. As the soil became depleted by wheat growing, the large fields were subdivided and used for horticulture. Agriculture thus came to provide a firm foundation for the state's economy. Settlements of Japanese and Korean migrants  used to exist along the railroad tracks, which would fill with thousands of workers during the citrus harvest. None of these remain, but the Santa Fe depot, like several others in the Inland Empire, has been restored to its turn-of-the-century glory. Today, many of Riverside's Asian Americans live in the sections of Arlington and La Sierra, the majority being Chinese American and Korean American. The largest Korean American church in the city is Riverside Korean Baptist Church near Arlington. Riverside's first Chinatown was located in Downtown Riverside, but growing anti-Chinese sentiment and a series of city ordinances, including one that outlawed laundry businesses in the Downtown Mile Square, precipitated the Chinese community's relocation to an area bounded by Brockton and Tequesquite Avenues. The last resident of this Chinatown, George Wong (Wong Ho Leun), died in the 1970s and the remaining buildings were razed. A proposed development spurred archaeological investigations of the Chinatown site in the 1980s. Artifacts that were unearthed during these investigations are housed at the Riverside Metropolitan Museum across from the Mission Inn Hotel. Following the archaeological study, the Chinatown site was placed on the National Register of Historic Places. The site had previously been landmarked as a State Point of Historical Interest, County landmark, and City Landmark. In 2008, the Save Our Chinatown Committee was formed to protect the Chinatown archaeological site from commercial development and increase awareness of Riverside's Chinese American history through public programming. In 1915 a Japanese immigrant named Jukichi Harada, proprietor for many years of a local restaurant, purchased a home in Riverside in the names of his American-born children in order to provide access for them to the public school system. Neighbors formed a committee and charged him with violating the California Alien Land Law of 1913, which barred aliens ineligible for citizenship from owning land. The case, The People of the State of California v. Jukichi Harada, became a test of the constitutionality of the law and progressed to the state Supreme Court, which ruled that the Harada children could own land. The Metropolitan Museum of Riverside now owns the Harada House, which has been designated a National Historic Landmark. Dalip Singh Saund, the first Asian-born politician elected to the United States Congress (and the only Sikh-American), was voted into office in 1956 to represent a district that included Riverside. A substantial community of Indian Americans including Sikhs and Punjabis lived in Riverside with the Inland Empire and the Colorado Desert regions (i.e. Imperial Valley) for nearly a century. Filipinos (see Filipino American) have been in Riverside for over 100 years. Known as the Pensionados, they were Philippine nationals sent to live in the United States to learn the principles of liberty and self-government. Since the US annexed the Philippines from 1898 to its independence in 1946, the Filipino community of Riverside and Riverside county are well numerous (i.e. in nearby Moreno Valley). At the intersection of Howard and 12th sits the last remnants of a formerly thriving African-American neighborhood. The old Wiley Grocery store now houses the activities of "Black" Prince Hall Masons. Nearby is the Church of Our Lady of Guadalupe, a pilgrimage site complete with shrine. Built and destroyed three times, the current incarnation dates from the 1920s. And the Bobby Bonds recreation center named for the major league baseball legend. Extensive information on Riverside's African American Community can be found on the Riversider.Org website. One of Riverside's claims to fame was the Riverside International Raceway. It was open from 1957 to 1989. Riverside was home to the Riverside International Raceway from September 22, 1957, to July 2, 1989. Races held at the Riverside International Raceway included Formula One, NASCAR, Can-Am, USAC, IMSA, IROC, and CART. The raceway was closed to make way for a shopping mall and housing development shortly after the raceway property was incorporated with the city of Moreno Valley in 1984. In 2003, plans were announced to build a 3-mile (4.8 km) road course near Merced, California, based on the design of the Riverside layout. The new track would have been known as the Riverside Motorsports Park. Riverside has had three minor league baseball teams: one in 1941 known as the Riverside Reds, and two from the class-A California League – the Riverside Red Wave from 1988 to 1990, and the Riverside Pilots (a Seattle Mariners Class-A minor league affiliate) from 1993 to 1995. The teams played at the UC-Riverside Sports Center also known as the Blaine Sports Complex. The Red Wave moved to Adelanto in 1990 to become the High Desert Mavericks and the Pilots moved to Lancaster in 1995 to become the Lancaster JetHawks. The Pilot's move occurred after a long-standing dispute between the Pilots, the California League, and the city to build a new facility to replace the Blaine Sports Complex. Today, a semi-pro collegiate team, the Inland Empire Rockets, plays some home games in Riverside and Moreno Valley. In the early 1940s before the start of World War II, the Riverside Reds whom played cross-region rival the San Bernardino Bucs when two major league teams – the Cincinnati Reds and the Pittsburgh Pirates held spring training in the area, followed by the California Winter League and in the 1950s, was the site for the Chicago White Sox and Philadelphia Phillies as well the St. Louis Browns (Baltimore Orioles). Riverside is the hometown of Bobby Bonds and his son Barry Bonds, and Dusty Baker, manager of the San Francisco Giants and Chicago Cubs. Although from Donora, Pennsylvania, Ken Griffey and his son Ken Griffey Jr. have residences in Riverside. 1846 On May 13 the United States declares war on Mexico starting the Mexican–American War. 1848 On February 2, California became a U.S. holding with the Treaty of Guadalupe Hidalgo, which ended the Mexican–American War. 1870 On March 17 John W. North distributes a leaflet titled "A Colony for California" from Knoxville, TN. 1870 On March 25 Dr. Greves distributes a leaflet titled "Ho! For California" from Marshall, MI. ^ Saunders was a nurseryman, landscape gardener and horticulturist. Among other things he designed the Soldier's National Cemetery at Gettysburg and the Lincoln Monument in Springfield, Illinois. See biography in 1899, Meehan's Monthly, 9; William Saunders, "Experimental Gardens and Grounds," in USDA, Yearbook of Agriculture 1897, 180 ff; USDA, Yearbook of Agriculture 1900, 625 ff. As the nation's chief experimental horticulturalist, he was responsible for the introduction of many fruits and vegetables to American agriculture; with five others he founded the National Grange and Patrons of Husbandry. See also, US Dept of the Interior, Pioneers of American Landscape Design II (Washington: GPO, 2000) 132–137. ^ "His greatest success... was the introduction of the Bahia or Washington Navel Orange... [which] practically revolutionized the orange industry in California at that time..."
^ "It is now generally recognized that one of the outstanding events in the economic and social development of California was the introduction of this orange in 1873." ^ State Board, 13: "Some of the earlier settlers, with foresight enough to see that there was profit in fruit, secured some of the mission orchards, and under skillful treatment and fostering care these were made productive again by careful pruning, cultivation, and irrigation. These enterprising orchardists reaped a golden reward for their labor." ^ There have been discussion, debate, and even demonstrations regarding this date. For their reviews of the existing evidence, see: Shamel & Pomeroy, Washington Navel Orange, 4–7, ff. ; C. S. Pomeroy, "1873 Washington Navel Orange Came to Riverside"; W. A. Taylor, Chief of the Bureau [of Agriculture]. Letter to James Boyd, September 15, 1920. unpublished, available from the USDA Library; U.S. House, Report of the Commissioner of Agriculture for 1884, 48th Cong. 1st Sess. Ex. Doc 178, (Washington: 1884) 7: "Distributed about 12 years ago"; Klotz: The local press of March 28, 1885, printed the following, "Mrs. L. C. Tibbets exhibits a branch from the original orange trees imported from South America to Washington, D.C. and thence to Riverside in 1873." ^ In 1933 two USDA officials wrote: "The very fact that the trees sent her survived the climatic and other hazards of those pioneer days is in itself remarkable and is probably due to the particular care given them by her." See also: A. D. Shamel, "History of Origin and Introduction of the Washington Navel Orange," The California Citrograph, (April 1933) 171: "These trees survived the climatic and other hazards, largely, I think, through the systematic care of Mrs Tibbets...."
^ The discovery of the fact that citrus fruits could be produced successfully and profitably, gave an impetus to the growth of a most important industry in our State, and especially in the southern counties, which is almost unprecedented in the history of our Union…. to Riverside is due the great impetus that brought the industry into national prominence. 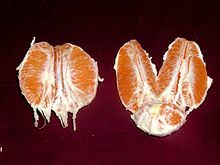 State Board, 20: It is also largely to Riverside that the orange industry is indebted for its present importance, from the success attained in the cultivation of the Washington Navel, an orange which achieved widespread fame for itself and the location (Riverside) where it was first successfully grown. ^ "From $10.7 million earned in 1900, to $83.2 million in 1920, to $144.6 million in 1930, citrus literally sucked eastern money west." ^ Tobey & Wetherell (1995) analyze "California's history in the half-century between 1890 and 1940 in terms of economic development in the context of the revolution in corporate capitalism" "To explain the region's history we must look beyond the rhetoric of speculative growth to the reality of investment-led growth, using models of economic development. For these we turn to Douglass North's Nobel-Prize-winning explanation of industrial revolution in the United States, and Albert Hirschman's theory of development that informed much of North's analysis. Textiles drove the antebellum North into sustained economic growth. We believe that the citrus industry, with its staple export crop of fresh table fruit, was a similar foundational industry that powered southern California' economy in the fifty years before World War II. ^ a b c Patterson, Tom. Landmarks of Riverside, and the Stories Behind Them. The Press Enterprise Company, Riverside, CA, 1964. Pages 174–175. ^ Why did Captain Juan Bautista de Anza return to Riverside, California?. Riverside Chamber of Commerce, 1975. Page 3. ^ "Juan Bautista de Anza National Historic Trail Guide: Riverside County". Solideas.com. Retrieved 7 November 2017. ^ Baggs, Terry. Making Riverside Work: The Benefits of the WPA. Journal of the Riverside Historical Society, Number Three, February 1999. ^ An Illustrated history of southern California : embracing the counties of San Diego, San Bernardino, Los Angeles and Orange, and the peninsula of lower California, from the earliest period of occupancy to the present time, together with glimpses of their prospects, also, full-page portraits of some of their eminent men, and biographical mention of many of their pioneers and of prominent citizens of to-day (Public domain ed.). Lewis Publishing Company. 1890. pp. 462–. ISBN 978-5-87987-880-6. ^ L. H. Bailey,The Standard Cyclopedia of Horticulture, 2nd ed. (New York: Macmillan, 1930) 3: 1594–95. ^ William Saunders' journal, unpub., quoted in USDA, The Navel Orange of Bahia, Bull. No. 445 (Washington, DC: GPO), 5–6. ^ USDA, Annual Report of the Commissioner of Agriculture, 64. ^ a b c d e f USDA, Yearbook of Agriculture 1937, (Washington, D.C.: 1937) 771. ^ Klotz, "Eliza Tibbets," 17. ^ Shamel & Pomeroy, The Washington Navel Orange, 31. ^ a b c d e f Shamel, 1915, 3. ^ Shamel & Pomeroy, Washington Navel Orange, 9. ^ Shamel & Pomeroy, The Washington Navel Orange, 8. ^ a b State Board, 13. ^ Dorsett & Shamel, 1917. ^ Tom Patterson, "The Tibbets, the Navel Orange, and the Dishpan," in Landmarks of Riverside and the Stories Behind Them (Riverside, CA: Press-Enterprise Co., 1964) 31. ^ Nash, State Government 117. ^ a b Nash, "Economic Growth," 318. ^ "California city honors first Korean settlement in U.S." Nbcnews.com. Retrieved 7 November 2017. ^ "Los Angeles Examiner, January 5, 1916, page 1" (PDF). Riversideca.gov. Retrieved 7 November 2017. ^ "Riverside, California - City of Arts & Innovation -". Web.archive.org. 21 January 2008. Retrieved 7 November 2017. ^ "Brochure". Riversideinternational.org. Retrieved 7 November 2017. ^ "History - California League About". California League. Retrieved 7 November 2017. ^ "California Winter League - BR Bullpen". Baseball-reference.com. Retrieved 7 November 2017. ^ Guideposts to History, 1977, second edition. Santa Fe Federal Savings & Loan Association. ^ a b "CATEWEB". Anza.uoregon.edu. Retrieved 7 November 2017. ^ a b c d Patterson, Tom. Landmarks of Riverside, and the Stories Behind Them. The Press Enterprise Company, Riverside, CA, 1964. Pages 17–20. ^ a b c d e Fitch, Robert J. Profile of a Century: Riverside County, California, 1893–1993. Riverside County Historical Commission Press, 1993. Page v–viii. ^ a b c d e f g h Mission Inn: A chronology. The Press Enterprise, 1986. Hall, Joan H. (1992). A Citrus Legacy. Riverside, CA: Highgrove Press. ISBN 0-9631618-0-6. Jefferson, Alison Rose (2007). Lake Elsinore: a Southern California African American Resort Area During the Jim Crow Era, 1920s–1960s, and the Challenges of Historic Preservation Commemoration. ProQuest. ISBN 978-0-549-39156-2. Patterson, Tom (1996). A Colony for California: Riverside's First Hundred Years (2nd ed.). Press-Enterprise Company. Sackman, Douglas Cazaux (2005). Orange Empire: California and the Fruits of Eden. Berkeley, CA: University of California Press. ISBN 9780520940895. Tobey, Ronald; Wetherell, Charles (1995). The citrus industry and the revolution of corporate capitalism in Southern California, 1887–1944. California History. 74. pp. 6–21. JSTOR 25177466. Lech, Steve (2007). Riverside 1870-1940. Charleston, SC: Arcadia Publishing. p. 127. ISBN 978-0-7385-4716-9. This page was last edited on 25 November 2018, at 17:14 (UTC).